Novel in 7 parts, written 1965 (finished 5.12.1965), published in 1967 in Czechoslovakia. Translated into English by David Hamblyn and Oliver Stallybrass. “The Joke"--a Czech novel that measures up to Czechoslovakia's wonderfully human films--is 40- year-old Milan Kundera's first novel but far from his first work. His collection of poems, "Monologues," was practically the only book of love poetry published in Czechoslovakia during the Stalinist era, and his three volumes of short stories, "Ridiculous Loves," have been best sellers there for several years. The lyrical and narrative skill he demonstrates in these earlier works comes through clearly in his novel. Though by no means a symbolist work, "The Joke" works well on several levels. The characters are valid both in themselves and as types in contemporary Czechoslovak society; the plot stands comparisons with the plots of novels that concentrate on their heroes' inner worlds, yet almost as a bonus it provides a miniature social history of Czechoslovakia during the past 20 years; and finally, the meditations on guilt and possibilities for change and the concept of history that underlies the logic of the novel's events are unquestionably worthy of attention. The year is 1965. Scientist Ludvik Jahn meets Helena, the wife of the man who had him expelled from school in the early 1950's. Bent on revenge, Ludvik carries through an elaborate seduction, only to discover that by giving his enemy a long-sought-for excuse to get rid of his wife, he has helped rather than humiliated him. Helena, in the meantime, has fallen in love with Ludvik, and when he rejects her, she attempts suicide. The book consists of four interwoven first-person narratives: Ludvik's, Helena's, and two others (that of a religious visionary in the process of losing his faith, and of Ludvik's peace-and-quiet- loving school friend, who sees his great love, folk art, distorted out of recognition by the regime); so we often have the same events and characters treated from several points of view. Each voice is stylistically and ideologically distinct; together, they make up a lucid and satisfying whole. Much of the narrative consists of flashbacks. Ludvik, the main character, who had been an enthusiastic young Communist during the immediate post-war years, tells how the joke of the title-- a postcard (OPTIMISM IS THE OPIUM OF THE PEOPLE! THE HEALTHY ATMOSPHERE STINKS! LONG LIVE TROTSKY!) to a naïve girl he was trying to impress--leads to his expulsion from the party and university, army service among the politically undesirable and several years in the mines. Despite some raucous army experiences, the pageantry of an ancient folk rite, a spate of sexual encounters and the hilarious outcome of Helena's brief encounter with death, "The Joke" is basically a tragic work. It's as if the Party was a human being. . .to confide in at a time when I have nothing to say to anyone," the desperately lonely Helena confesses. She cannot stand the thought of having her life split in two--by admitting that the party (and thus her life over the past 20 years) was inhuman and thereby being forced to adopt a new set of values. In Helena, Kundera has set forth the main psychological blocks at work in the neo-Stalinist-mind. It is much to Kundera's credit that he does not depict his hero, a dissident intellectual like himself, as a man with all the answers. Ludvik himself realizes he is doing everything possible to prevent time form healing his wounds, but hate has crowded out all other emotions from his life. His awareness of the inadequacy of this position reaches a crescendo in the last scene, when he sees his childhood friend in the throes of a heart attack. Ludvik identifies this illness which his friend may survive, but which will totally incapacitate him) with the fate of his generation. He comes to see that this generation--still in its thirties--has already had its say. But he does not find much solace in the younger generation, not at least in the two representatives he introduces toward the end of the novel. Their all-pervading interest in themselves he deems every bit as petty as his contemporaries' ideal of falling in love out of duty to the party. This skepticism leads Ludvik to a more abstract interpretation of his situation. Since so many people were involved in the injustice of the 1950's (either doling it out or suffering the consequences), he concludes that one must blame history, not humans, for the crimes. The joke then no longer belongs to him; it is history's joke , and how can man escape history? The translation succeeds quite well in reproducing the tone of the original, but omits whole sentences, paragraphs, and--in one instance--an entire chapter. In an exchange of letters in The London Times Literary Supplement between an outraged Kundera and one of the translators, it has come to light that the editor went ahead with the cuts after two unsuccessful attempts to contact the author for his permission. Apparently the object was to make the novel read more easily; the missing chapter, for example, deals with the place of folk music in modern society. Fortunately, "The Joke" retains its bite even with the omissions. It reveals a great deal about the background to liberalization in Czechoslovakia, and--more important--it offers a genuinely humane look at inhumanity. 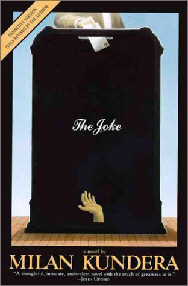 "The Joke" is a work of sharp psychological perception and great literary finesse.